This paper reports on the development of a measurement instrument to perform gloss measurements using an image-based detector. The image-based gloss meter was built according to the specifications of the optical layout of a specular gloss meter in a 60° measurement geometry, as described in ASTM D523-14. The photodiode detector was thereby substituted with a CMOS detector. The optical layout of the system was designed and validated by the use of ray tracing software. A series of 16 matte to high-gloss test samples, with nominal gloss values ranging between 3 and 90 gloss units, was used to compare specular gloss measurements obtained with the developed instrument and a commercial specular gloss meter. An average and maximum deviation of only 1.2 and 2.7 gloss units, respectively, was obtained, confirming the suitability of the system to perform standard specular gloss measurements. The potential benefits of the image-based approach were then studied. By way of example, the optical characterization of orange peel and contrast gloss by the use of the system was discussed, corroborating the fact that the proposed instrument offers important opportunities for a more global characterization of the total gloss impression. Apart from its appropriateness for quality control purposes, a specular gloss meter suffers from some important inconveniences.5 One of the major drawbacks of the instrument is that it does not offer the possibility to assess the entire visual gloss impression. Indeed, besides the aspect of specular gloss, which might be linked to the amount of specular reflection, other visual attributes such as the distinctness-of-image, haze, contrast gloss, and orange peel have been introduced as a result of the multidimensional nature of gloss perception.5,6 Following this introduction, new standards and measurement instruments have emerged, each of them paying attention to a particular attribute of gloss. Today, a combination of different instruments (specular gloss meter, haze meter, orange peel meter, etc.) is therefore used for the global assessment of gloss. In this paper, a measurement instrument allowing for a more global evaluation of gloss is presented. In essence, an image-based gloss meter (i-GM) is built according to the specifications of the optical layout of a specular gloss meter using the 60° measurement geometry, but the photodiode has been replaced by a CMOS image detector. Starting from a calculation and analysis of the optical layout of the system by the use of ray tracing software, the hardware prototype of the i-GM has been designed and is presented. The appropriateness of the i-GM to perform specular gloss measurements is evaluated from measurements on a series of 16 matte to high-gloss samples, taken from the Natural Color System® (NCS) gloss scale (NCS Colour AB). 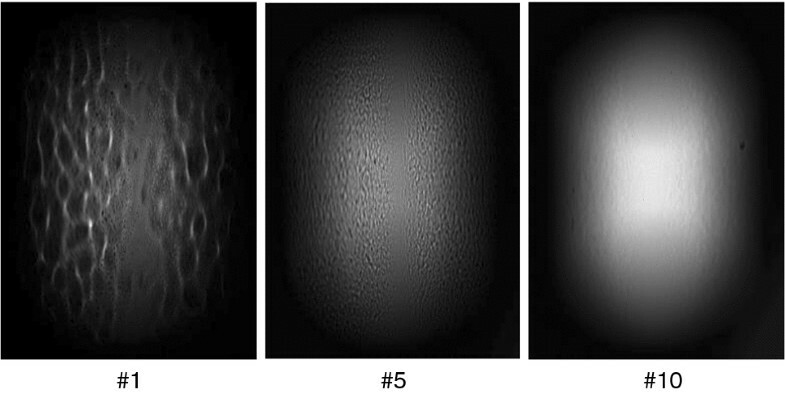 Potential benefits of the i-GM are studied and exemplified; orange peel is quantified by applying image analysis techniques to the recorded images, while the inclusion of an additional light source allows for the evaluation of contrast gloss. Test and validation experiments are presented and discussed to confirm the versatility and potential of the i-GM. 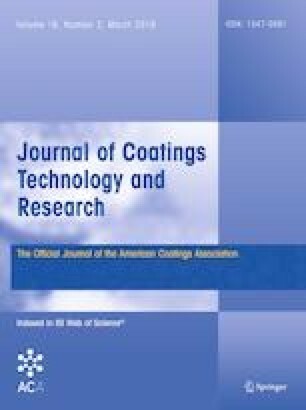 The aim of this study is to develop an i-GM for characterization of gloss characteristics beyond specular gloss alone. The main prerequisite of the new instrument is to deliver specular gloss values which correspond to measurement results obtained with a commercial specular gloss meter. Since this is the standard geometry for specular gloss assessment, the 60° geometry was put forward for use in the proof of principle. the angular dimensions of the receptor field stop are measured from the test surface. A schematic overview of the i-GM, based on a ray tracing simulation of the system with a black reference glass as test specimen, is presented in Fig. 1. For the sake of clarity, only a fraction of the rays intersecting with the projection lens are depicted. 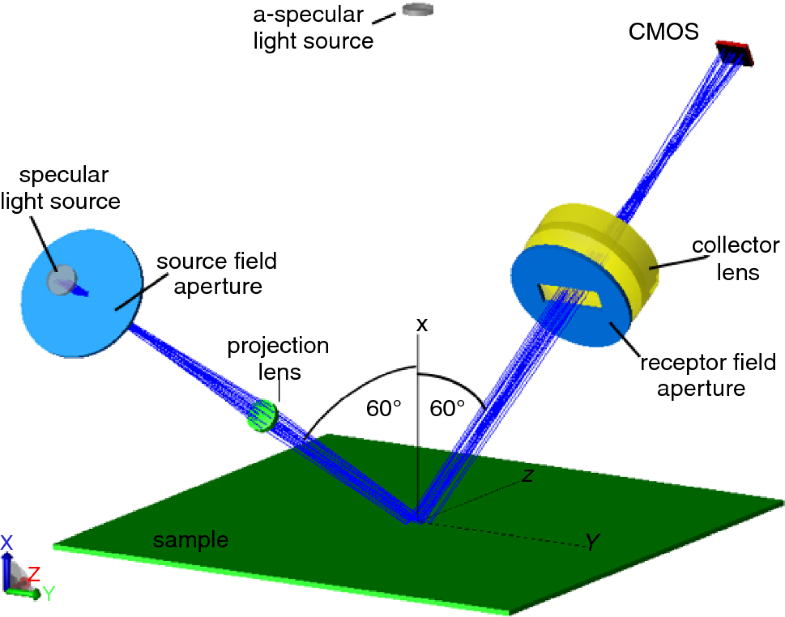 The specular light source of the i-GM consists of a LED module (Xicato XSM 80) in front of which a source field aperture with dimensions 1 × 3 mm (height × width) is positioned. This source field aperture, which acts as the aperture stop of the illumination system, is imaged onto the receptor field aperture by the use of a plano-convex projection lens (Edmund Optics t47-469, f = 48 mm). Taking into account the nominal dimension of the source image in the plane of measurement (i.e., 0.75°), an object and image distance of 76.3 and 129.3 mm, respectively, is obtained. With this object distance, the dimension of the source image perpendicular to the plane of measurement is also within the defined tolerances (2.5° ± 0.5°). A CMOS camera (IDS Imaging Development Systems GmbH—Type UI-5460SE-C-HQ Rev.2) is used as detector. The image sensor (Aptina Imaging Corporation—Type MT9T001) dimensions are 6.55 × 4.92 mm (width × height), while the resolution numbers 3.15 Mpixel (2048 × 1536). In front of the camera, a collector lens (Edmund Optics T 49-662, f = 30 mm) is installed in order to image the test specimen surface onto the CMOS image sensor. To minimize the outer dimensions of the i-GM, the test surface location is chosen to be in the middle of the image distance of the projection lens. The resulting footprint of the illuminated area of the test sample surface, as viewed perpendicular onto the surface, equals 6 × 7.5 mm. The object distance from the test surface to the collector lens numbers 64.7 mm. Taking into account a fixed image distance of 56 mm from collector lens to CMOS image sensor, a collector lens with f = 30 mm is put forward. In front of the collector lens, a second aperture is positioned, which acts as the receptor field stop of the system. Similar to the source field aperture, the dimensions of the receptor field aperture have to be chosen in agreement with the requirements stipulated in Table 1 and can be calculated taking into account the image distance of the projection lens and the dimensions of the source field aperture. The receptor field stop dimensions are 5 × 13.5 mm (height × width). Additionally, a second light source, called the a-specular light source, has been incorporated into the system, in the direction of the normal on the test surface. This source will be used to determine the background luminance of the test surface when characterizing contrast gloss, as will be discussed further (see section “Contrast gloss”). A picture of the built prototype i-GM is presented in Fig. 2. The outer dimensions of the instrument are about 33 × 6 × 11.5 cm (length × width × height). All optical components are mounted between two vertical aluminum plates, which are painted black in order to minimize stray light from off-specular directions from entering the camera. For measuring larger samples, the i-GM can be positioned directly on the test surface, while for smaller test surfaces, the instrument can be turned upside down in order to simply place the sample upon the system (as shown in Fig. 2). The bottom side of the instrument is intentionally left open in order to be able to perform further manipulations, as described further. As a consequence, all described measurements had to be performed in a dark room. Yet, in a later stage of development, the device could be completely enclosed such that no ambient light would influence the readings, and field measurements could become possible. The stability of the specular light source was checked by performing 30 measurements in sequence and calculating the standard deviation of the reported signals. 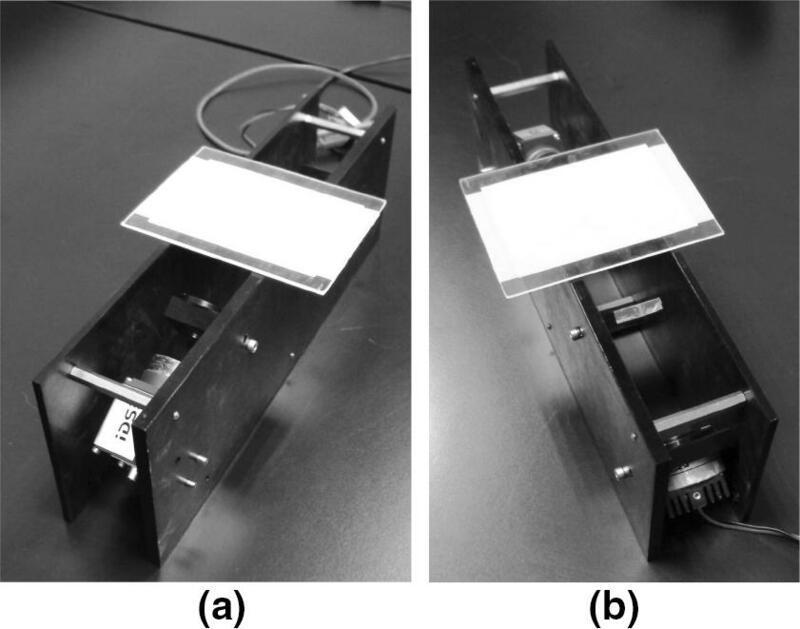 In this experiment, the LED module was driven by a constant current of 10 mA, and a black reference glass (mirror) is used as the test specimen to reflect the incident light into the receptor field aperture. The reported response signal consists of an integration of all pixel values. The results indicate a standard deviation of the signal of only 0.03%, confirming the stability of the source. Linearity of the response of the V(λ) corrected green channel of the camera with integration time t was checked, for integration times ranging between tmin = 0.041 ms (the minimum integration time which can be applied) and tmax = 500 ms. The maximum integration time was determined based on indicative measurements on a black diffuse sample. Results indicate a linear correlation over the entire range of integration times. To ensure or guarantee acceptance of the new i-GM within industry, it is important that the specular gloss measurement data correspond to the data from traditional specular gloss meters, within acceptable limits. A series of 16 matte to high-gloss NCS paper samples [white (W), gray (G), and black (B)] was chosen to check this correspondence. All paper samples were fixed on a flat glass substrate for measurement. Conventional specular gloss measurements were performed in the 60° measurement geometry with a BYK-Gardner micro-TRI-gloss-S conventional gloss meter. Measurements were repeated at three different surface locations to check spatial uniformity. Mean values, expressed in gloss units (GUs), are reported in Table 2. Similar measurements were performed with the i-GM. The reference black glass tile of the conventional gloss meter, the gloss value of which is reported by the manufacturer, was thereby used as a reference. Gloss values of the 16 test samples were calculated from the ratio of the integrated image signal of the test sample to the integrated image signal of the reference, both corrected for the corresponding integration times during the respective recordings. The resulting gloss values of all 16 test samples are also presented in Table 2. On the exception of the results for sample NCS B G40 (a black mid-gloss sample with an indicated nominal specular gloss value of 40 GU), a good correspondence between the results obtained with both devices is obtained for all test samples. On average, the absolute difference between the measurement results from the two devices equals 1.5 GU, while the maximum difference, neglecting test sample NCS B G40, numbers 2.8 GU. These deviations might seem important, yet a recent study on the inter-instrument agreement between conventional specular gloss meters has demonstrated that, in practice, significantly higher deviations of up to 5 GU do not constitute an exception.7,8 For test sample NCS B G40, a difference of 6.4 GU is observed. However, this deviation can be partly assigned to the lack of surface uniformity of this sample. Indeed, repeated measurements on three different locations of the test surface with the conventional gloss meter indicate gloss values varying between 52.0 and 61.0 GU, while for the other samples, a variation within 2 GU was found. As a result, it can be concluded that the prerequisite for the i-GM to deliver specular gloss measurements in accordance with the measurement results obtained with a commercial specular gloss meter is fulfilled. Research findings throughout the past decade have confirmed a multidimensional account of the perception of surface gloss. Instead of completely relying on the surface reflectance, the visual system seems to analyze and to rely on available diagnostic cues when making a perceptual judgment of gloss.9–12 Although the exact mechanism of gloss perception remains unknown, it could therefore be envisaged, from a metrological point of view, investigating individual quantitative scales of reported visual cues to glossiness. As such, a characterization of different diagnostic image cues in conjunction with specular gloss, such as those related to surface nonuniformities (orange peel, gloss mottle, etc.) or to the contrast between the specular highlight and the background, would be beneficial. Orange peel has been defined as ‘the appearance of irregularity of a surface resembling the skin of an orange’.13 It is a generally undesired visible surface nonuniformity which typically results from an improper paint application technique, and can be observed as a wavy pattern of bright and dark areas. Within industry, orange peel is generally quantified with an orange peel meter, by the use of which the optical profile of the sample surface is scanned with a laser or LED light source.14 From the profile structure, a set of numbers is calculated using mathematical band-pass filter functions, which form a structure spectrum. This structure spectrum then allows for an analysis of the orange peel. As an alternative, a technique called ‘phase stepped deflectometry’ might be used.15 In this method, a display is used to project a fringe pattern onto the test surface, and a camera captures the reflected image of the pattern. Knowing the geometric relationship between the display, surface, and camera, the optical profile can be spatially modelled from the captured reflections. Finally, equivalent to the former method, band-pass filter functions are used to simulate the human eye resolution at various distances. Three samples out of a dedicated set of 10 orange peel visual reference standards developed by ACT Test Panels LLC were selected for use to test the suitability of the i-GM to capture and quantify the phenomenon. 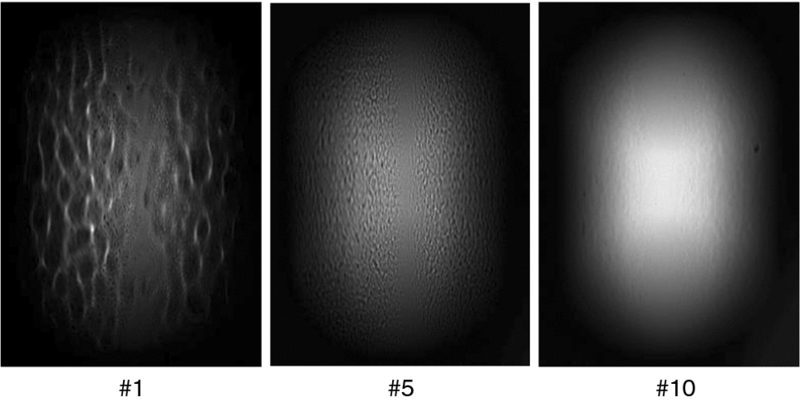 The acquired image of these three samples, denoted as Orange Peel Standard (OPS) #1, #5, and #10, respectively, is presented in Fig. 3. The samples exhibit a high, medium, and low degree of orange peel, respectively. As stated before, for these measurements, the collector lens of the i-GM is positioned to image the sample plane onto the detector array. A clear difference between the three surface topographies can be observed. The images can be analyzed by the use of digital image processing techniques. Figure 4 presents the result of a discrete fast Fourier transform of a horizontal cross section for each sample. A clear distinction in the Fourier magnitude spectrum of the three samples is obtained. As expected, the fundamental spatial frequency predominates the image of the test surface with no visual orange peel effects (OPS #10). For the surface with moderate orange peel (OPS #5), larger frequencies come into play, while the range of encountered spatial frequencies as well as the importance of larger frequencies further increases for the surface that exhibits the highest orange peel (OPS #1) (Fig. 5). The visual contrast between an observed highlight and the sample background is known to be of primary importance in visual gloss appraisal, especially for high-gloss surfaces.16,17 The concept of contrast gloss has been reported for a longer time. Hunter defined contrast gloss as the type of gloss that produces a characteristic appearance of contrast between specularly reflecting areas and other areas of the surface.6 Jones proposed an instrument for quantifying contrast gloss, based on a comparison of the reflectance from the sample in the specular reflection direction (45° viewing direction for a 45° light incidence angle) with the reflectance at normal viewing direction.18 However, to the best of our knowledge, no industrial measurement device is currently in use, neither is there any applicable (normalization) standard in which a measurement method for contrast gloss is defined. To exemplify the concept of contrast gloss, a rendered picture of a white vs. a black sphere with the same physical gloss parameters (in terms of the specular reflectance and spread of the specular lobe, according to Ward’s light reflection model),20 enclosed in a checkerboard box illuminated by an overhead area light source, is presented in Fig. 6.16 Clearly, the black sphere produces a higher visual gloss impression, although the same physical characteristics are attributed to both spheres. A classical gloss meter will report the same gloss value, but the higher contrast clearly induces a larger visual gloss perception. By inclusion of a second light source (called the a-specular light source) in the i-GM (see Fig. 1), positioned in the direction of the normal on the test surface, it becomes possible to quantify the background luminance of the test surface in conjunction with the specular reflection originating from the specular light source. Therefore, a second Xicato XSM 80 LED module was introduced to act as the a-specular light source in the instrument and baffled to prevent stray light from entering the CMOS detector directly. Similar to the specular source, this a-specular light source was driven with a constant current of 10 mA. As a measurement example, the acquired images of test samples NCS W G90 and NCS B G90 (white and black test samples with nominal specular gloss of 90 GU, respectively), captured with the updated i-GM with both sources turned on, are presented in Fig. 7. An obvious difference in background luminance between both test surfaces can be observed. In practice, the luminance contributions originating from specular and a-specular reflection can be most easily separated by taking two images in sequence, respectively, with only the specular and only the background source turned on. Based on our proposed visual contrast gloss equation,19 the visual contrast gloss impression of the black sample is thereby quantified to be 1.5 × higher than that of the white sample. Results from specular gloss meters are solely based upon the amount of specular reflection. In that sense, they do not offer information about additional cues to surface gloss. In this paper, a prototype i-GM has been proposed that does offer the possibility to quantify multiple attributes of surface gloss simultaneously. The instrument makes use of an image-based CMOS detector. The i-GM has been designed such that specular gloss readings correspond with results from a conventional gloss meter obtained in a 60° measurement geometry; on a series of 16 matte to high-gloss test samples, an average absolute deviation of only 1.5 GU has been reported. For the new camera-based instrument to be accepted, this accordance with the current traditional and widely used instrumentation is essential. Besides specular gloss, it has been demonstrated that the i-GM can be used to quantify orange peel and contrast gloss. For the assessment of orange peel, new industrial instruments have already been proposed. However, these instruments do not provide information on specular gloss or contrast gloss and thus need to be used in combination with other instrumentation if a full characterization of the surface appearance quality is to be considered. In comparison with a standard specular gloss meter, they are moreover expensive. Finally, these instruments consider and assess orange peel indirectly from a characterization of the surface profile or texture. With the proposed i-GM, orange peel is assessed directly from the acquired reflection image using well-known image post-processing procedures. The use of a low-pass, band-pass, or high-pass filter in the frequency domain seemed thereby appropriate to distinguish between surfaces with high, medium, or low orange peel, respectively. 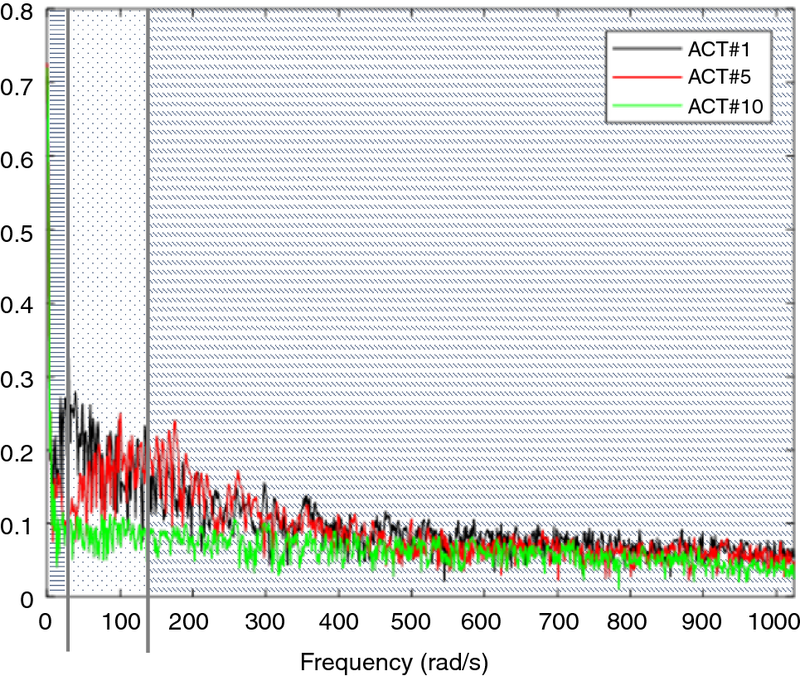 Yet, the selection of the cutoff frequencies from the amplitude spectrum was made rather arbitrarily. Clearly, the development of a procedure for appropriate selection of the cutoff frequencies is a point of attention. Therefore, more in-depth investigations on different materials (paper, wood, plastics, etc.) are needed, in order to find out which type of band-pass filter is the most appropriate for orange peel segmentation. Ultimately, it remains to be explored whether a so-called orange peel index could be inferred for quantifying orange peel by the use of just one metric, in analogy with specular gloss. While alternatives have been proposed for orange peel, to the best of our knowledge, no industrial instrument exists which quantifies contrast gloss. 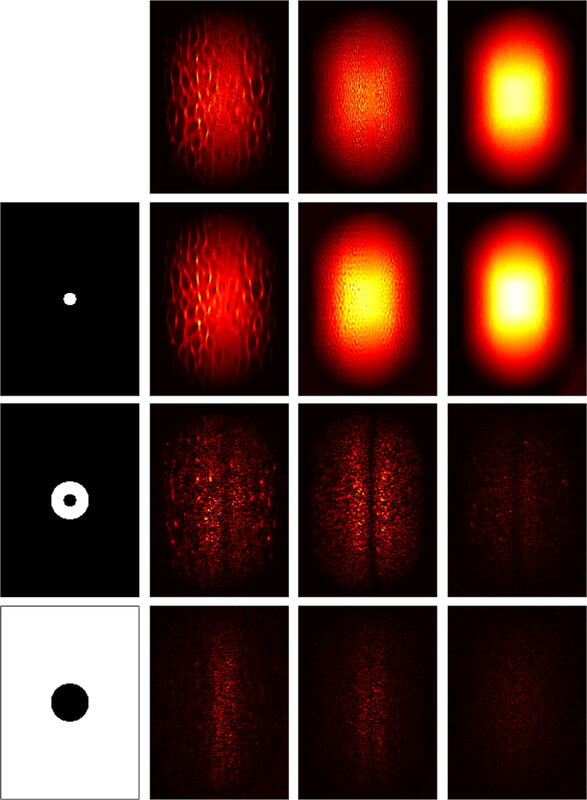 By simple inclusion of a second, a-specular light source into the i-GM, it was demonstrated that contrast gloss can be assessed rather easily by performing two image acquisitions in sequence, with the specular and a-specular light source alternately turned on. As an example, white and black samples with equal specular gloss were assessed. While the concept of contrast gloss and the search for a suitable metric has been investigated before, the i-GM has proven to be able to determine a numerical value, at least on achromatic samples. Further psychophysical research should be performed on a dedicated set of chromatic stimuli to find a correlation between visual contrast gloss and the specular and off-specular characteristics, taking into account colorimetric information. The i-GM, being equipped with an RGB sensor, will have the potential to record all the necessary input parameters. Finally, the presented i-GM offers some additional opportunities which were not discussed in this paper. Surface defects and nonuniformities such as scratches, dents, or gloss homogeneity can easily be detected, and even the nonuniform texture of effect coatings, i.e., sparkle and graininess,24 can be analyzed. These aspects need further exploration to discover the full potential of the i-GM. An important aspect of gloss that has not been addressed in this manuscript is the so-called distinctness-of-image (DOI), which is perceptually related to the distinctness and sharpness of the reflected images.6 The reason for this is that in order to assess DOI, the camera lens should be focused on the projection lens instead of on the sample surface. For this, the distance between camera and collector lens thus needs to be changed, which is impossible with the current prototype. In order to overcome this issue, an objective lens with variable focus might be envisaged. This alternative will be investigated in the near future. This work has been partially funded by the Flemish Government through the Agency for Innovation and Entrepreneurship (Project IWT 140920), and by the EMPIR programme co-financed by the Participating States and from the European Union’s Horizon 2020 research and innovation programme (Grant No. JRP 16NRM08).